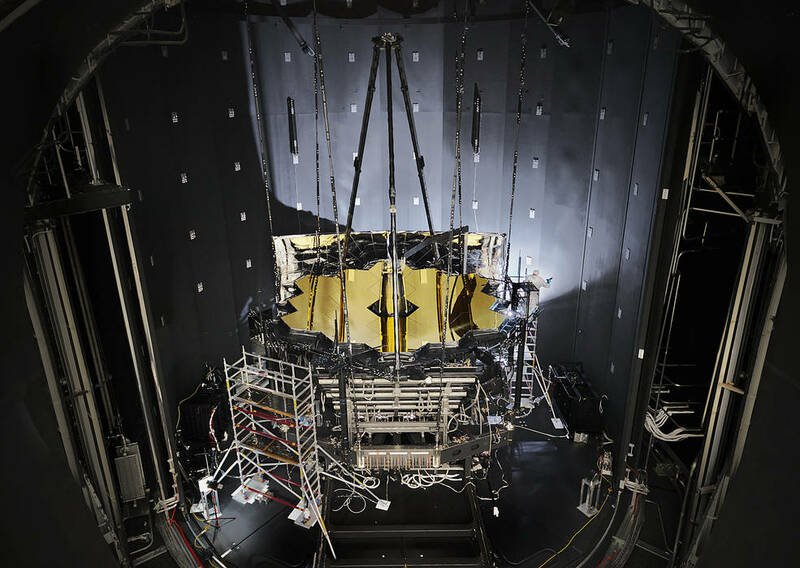 From July 10th to November 18th, the James Webb Space Telescope (JWST) remained sealed inside a cryogenic chamber at NASA’s Johnson Space Center in Houston Texas. It’s successful emergence signals positive feedback that the spacecraft could withstand a climate similar to frigid outer space. After 15 years of planning, chamber refurbishment, hundreds of hours of risk-reduction testing, the dedication of more than 100 individuals through more than 90 days of testing, and surviving Hurricane Harvey, the OTIS cryogenic test has been an outstanding success… The completion of the test is one of the most significant steps in the march to launching Webb. Scheduled to launch spring of 2019 from Kourou, French Guiana, the James Webb Space Telescope is a large infrared telescope equipped with a 6.5-meter primary mirror. Studying infrared will allow astronomers to better understand the most distant events of the early universe, stellar and planetary formation, and to image exoplanets and novae. The detection capabilities of the JWST range from near-infrared and mid-infrared wavelengths, to orange and red visible light. Infrared light is difficult to detect on Earth-based telescopes because water vapor absorbs infrared at many wavelengths. However, for example the twin Keck Observatory telescopes in Hawaii, located at the 13,796 Maunakea summit, demonstrate that infrared observations are possible from Earth only if located at extremely high in altitudes and therefore at relatively dry climates closer to the upper atmosphere. Imaging from a spacecraft is more precise because it is outside the interference of the Earth’s atmosphere. The JWST is expected to surpass previous infrared imaging instruments due to its extreme sensitivity to redshift, when a light emitting object moves away from the observer. Objects, such as galaxies, appear to be moving away from us at an increasing rate and therefore can be measured through redshift. Therefore, detecting redshift can help astronomers better understand phenomena such as the expansion of the universe. Although often cited as the eventual replacement for the famous Hubble Space Telescope, the JWST is actually different. Hubble imaged the universe in primarily ultraviolet and optical wavelengths, while the JWST will peer earlier into the universe through its infrared capabilities. Astronomy, cryogenic, James Webb Space Telescope, JWST, science. Bookmark.